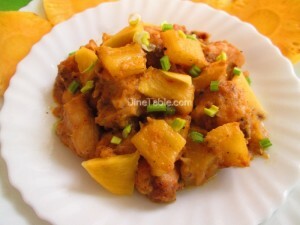 Pineapple chicken is a tasty chicken dish. It is a perfect combination with roti, chapati, paratha, bread and rice. This is a unique dish with the rich taste of different sauces. This is lightly sweetened with the taste of honey and pineapple. It can be served in special occasions like parties and festivals. By serving this special chicken recipe can surprise the guests. Using pineapple can make different food items like cake, cookies, dessert, salad, payasam etc. Pineapple is a commonly available fruit and healthy also. It helps to control asthma, blood pressure, digestion, diabetes etc. Try this tasty recipe & enjoy the taste! Cut the chicken into pieces and clean in water. Heat vegetable oil in a pan and add minced garlic and saute it for about 3 minutes. Add the chicken pieces, pepper powder and salt then fry for about four minutes till the chicken turned into brown and crunchy. Remove from the heat and keep aside. In the same pan add the chopped onions and bell peppers then stir fry it till soft. Add pineapple pieces and saute for a minute. Add 1/3 cup of pineapple juice, honey, garlic-chilly pepper sauce, fish sauce, oyster sauce, sugar and vinegar. Boil for 2 minutes. Add fried chicken and mix well. Allow it to boil and cook for 5 minutes. Stir fry the pineapple chicken. Now the pineapple chicken is ready to serve.